It is never necessary to enter an ALBRIGI tank to clean it! 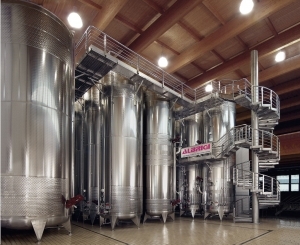 For more than 30 years, Albrigi has been the leading manufacturer of stainless steel tanks for the wine industry. 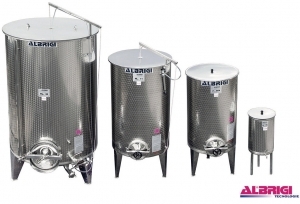 Albrigi tanks are made from the finest, mirror-polished AISI 304L and 316L stainless steel, specifically designed for wine making, and sourced from Thussen Krupp in large lots to ensure constant high quality. Interior surfaces are mirror polished in series to a 2R finish, with a standard roughness of .05 Ra pharmaceutical, and are essentially ready to be used when shipped. Interior seams are pickled, cold pressed and polished to provide for virtually invisible, easy-to-clean seams. Exterior surfaces are mirror polished and exterior seams are brushed, ground and polished. Like the interior welds, the exterior welds are virtually invisible. Following construction, all tanks are pickled and passivated using a biodegradable passivation agent (not Nitric acid). Interior surfaces are then polished with sisal to obtain Albrgi’s “High Clean” surface. All of Albrigi’s tanks can be cleaned effortlessly with steam or hot water without the use of caustic cleaning agents. 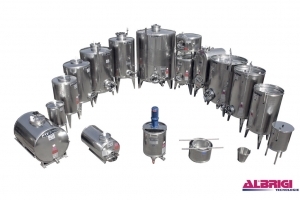 Prior to shipping, all tanks are pressure- tested and hydro-tested for 24 hours to check for integrity. Also unique to Albrigi is the fact that all Albrigi tanks come with an “Original Food Services” certificate. 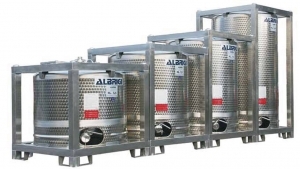 Albrigi tanks are made to such exacting standards they are GUARANTEED FOR 25 YEARS! Please see our online catalog for full details.